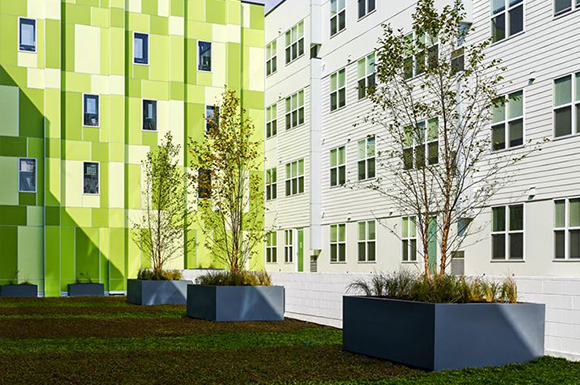 Paseo Verde is a $48.2 million mixed-use, transit-oriented, green development in Philadelphia’s Ludlow community - a low-income, distressed neighborhood currently undergoing a revitalization drive fueled by strong public and private collaboration. The multi-building development features 120 units of affordable and workforce housing. Fifty-three units are affordable to families with household incomes between 20% and 60% of the area median income (AMI). The other 67 units are targeted to low-income families making less than 100% of AMI. The project’s 30,000 square feet of commercial and retail space include a primary care health facility, pharmacy, and social services office. The 1.9-acre brownfield site is located directly adjacent to the Temple University Regional Rail train station.